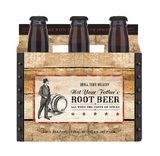 Not Your Father’s Root Beer is a category-defining craft specialty ale brewed with unique spices. Brewer Tim Kovac’s creativity and painstaking commitment to flavor complexity results in an unmistakable offering that masterfully blends hints of sarsaparilla, wintergreen, anise, and vanilla. A smooth and balanced Ale, NYFRB has broad appeal – from discerning craft beer drinkers to non-beer drinkers.